Sridevi and Anil Kapoor's chemistry had the potential of being playful but they also had the charisma that could set the screen on fire. 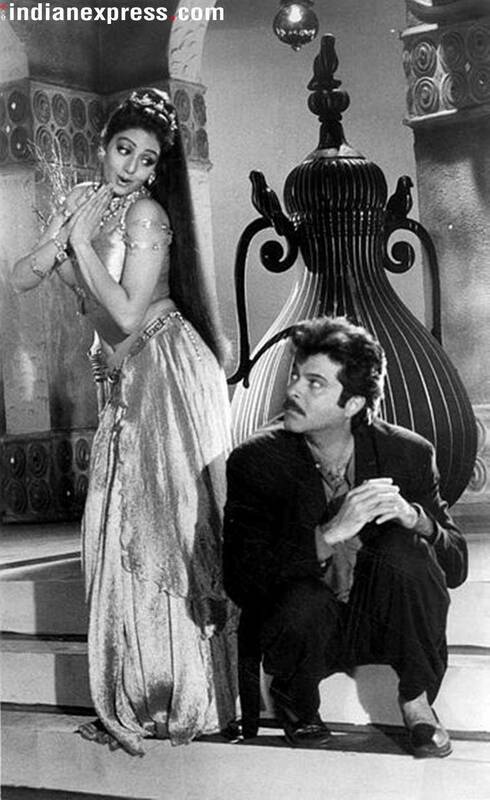 Through the decades of 80s and 90s, Sridevi and Anil Kapoor starred in as many as 13 films together. Sridevi and Anil Kapoor became a part of the same family much later when the Chaalbaaz actor married Anil’s older brother, producer Boney Kapoor. Sridevi and Anil Kapoor on the silver screen together were just magical. Their chemistry had the potential of being playful but they also had the charisma that could set the screen on fire. Through the decades of 80s and 90s, Sridevi and Anil Kapoor starred in as many as 13 films together. The two became a part of the same family much later when the Chaalbaaz actor married Anil’s older brother, producer Boney Kapoor. Though the two first appeared together in Subhash Ghai’s film Karma in 1986, they did not share much screen space. In this film, Sridevi played Jackie Shroff’s love interest and Anil Kapoor was cast opposite Poonam Dhillon. But soon after, Shekhar Kapur cast the duo in the now iconic film Mr India. In Mr India, Anil played Arun, a violinist who is struggling to make ends meet and Sridevi played a journalist who rents out a room in Arun’s house where he lives with orphans. Seema and Arun start off on a shaky note but Seema is eventually transfixed with the idea of Mr India without realising that it is in fact, Arun. The two actors’ comic timing complimented each other beautifully. The scene where they spot a cockroach is a laugh riot and the song “Kaate Nahi Kat-Te” had them romancing each other sensuously. After Mr India, they co-starred in films like Ram-Avtar, Sone Pe Suhaaga, Joshilaay, among others but it was the 1991 film Lamhe, that can truly be called their best performance together. Sridevi played Pallavi and Pooja in the film and it was a love triangle with Anil Kapoor’s Viren. Viren falls in love Pallavi who is much older than him, yet his love is honest and pure. She marries someone else and is completely oblivious to Viren’s feelings. It is upon her passing that she leaves her daughter Pooja under Viren’s care. Viren stays away from the child for almost two decades but as fate would have it, she has her mother’s face. Upon meeting him for the first time, Pooja falls for Viren just like he had fallen for her mother. But unlike Viren, she is outspoken, bold and unabashed about her love. Sridevi’s child-like innocence as Pooja and her graceful demeanour as Pallavi were poles apart, yet she pulled off both these roles perfectly. Her poised chemistry with Viren as Pallavi and her go-getter attitude as Pooja were both just as impressive. The two then co-starred in a few other films together but what made headlines was 1993’s Roop Ki Rani Choron Ka Raja. This was the most expensive film at that time and tanked at the box office. It was produced by Boney Kapoor. Laadla also happened to have these two in lead roles. The film originally starred Divya Bharti in the lead role but due to her untimely demise, Sridevi was cast in her place. Here, she was the boss lady who runs her own business and is a strong headed individual. Anil Kapoor plays a mill worker in her factory and the two end up getting married just so they can extract revenge on each other. Sridevi and Anil Kapoor were last seen together in 1997’s Judaai where they played husband and wife. This was Sridevi’s last performance on the silver screen before she took a 15-year long break. Sridevi and Anil Kapoor looked natural and organic on screen. Be it hatred or love, this couple could pull off anything on the big screen. Their Hindi films will always be treasured and our wish to see them together on the silver screen again will now remain unfulfilled. 3 Remembering Sridevi: Can you think of any other star who has continuously faced the camera for 50 years?